Often times I hear from people that they “eat clean”. They also describe afternoon energy lulls that require a snack or caffeine boost to get them through the rest of their day. Upon further investigation into WHAT they are eating we discover that their “clean diet” might still be overrun with SUGAR! When I say sugar I mean any type of carbohydrate: processed sugar, fruit, sweet potatoes, rice, granola, etc. The RED LINE. When you any type of food you get a bump in your energy and blood sugar levels. When you eat something sugary or carb-dense you get an even larger spike - this is where the SUPER-SMILEY faces come in. You know the feeling; you’re a little “low” so your brew a cup of coffee and grab a gluten-free muffin and instantly feel better. Once that little high wears off, when you get hungry, or “hangry” as some like to call it, your energy dips way down and you don’t feel great - insert FROWN face. These severe ups and downs put you into a pattern and can be a sign that it is time to focus on regulating blood sugar. The GREEN LINE still has rises and falls, but they are not as pronounced. This represents a more steady, even energy throughout the day. You might not feel as energized after you eat, but you also won’t get major crashes. Someone transitioning in their nutrition journey to more whole foods might report, “I just don’t feel much energy” and that can be exactly the case. That person is no longer getting super “high” from that sugary snack or meal so they don’t feel the energy surge they used to. This is a good thing. If you say you “eat clean” but still have major highs and lows in your energy patterns throughout the day, you might need to look at what you’re actually eating. Sometimes the key to balancing energy rhythm is making sure you have more balanced meals: Protein, carbs, fat, fiber. Breakfast is where this daily energy pattern begins, so make it full or protein, good fats, and greens! Sometimes you need to limit carbs, like at lunch, so you don’t have a huge crash at 2 or 3pm. Sometimes just adding a but more fat to a meal, like some avocado, will do the trick. Just like training, our nutrition is very dependent upon us as individuals and our goals. 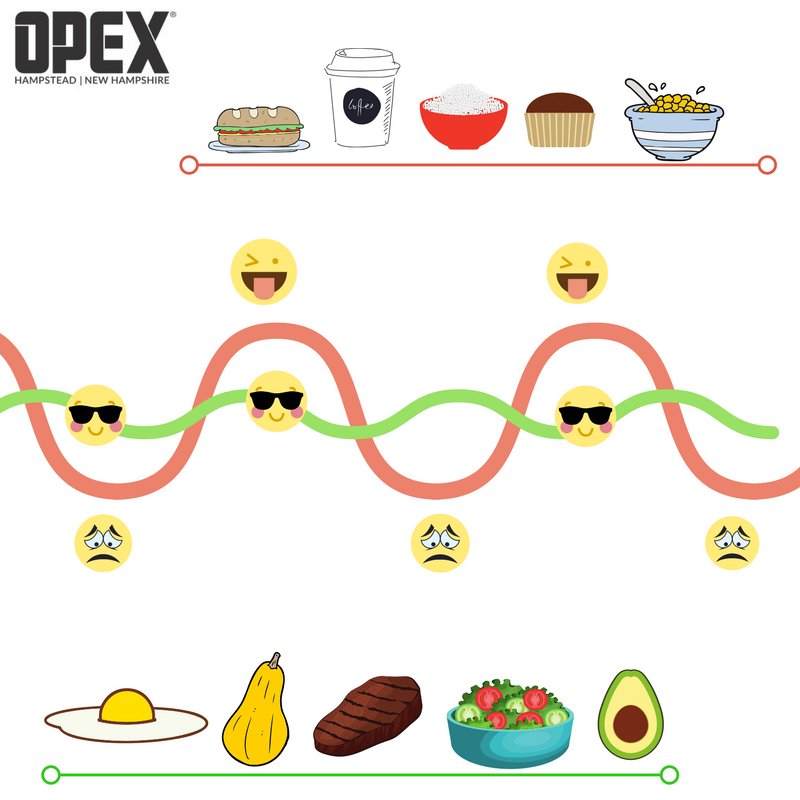 If you have questions or concerns about your individual nutritional needs or daily energy rhythm, bring it up with a Coach at OPEX Hampstead.